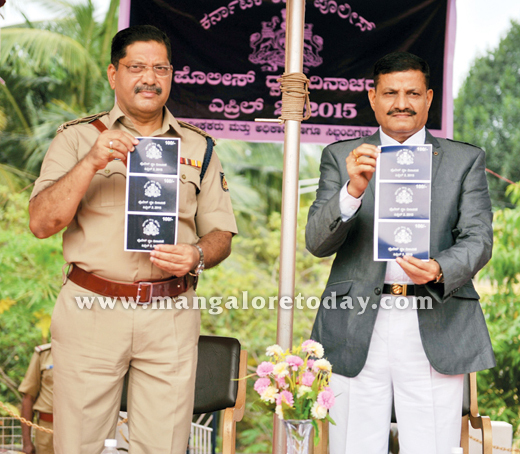 Udupi, April 03, 2015: Speaking after receiving the honour at Police Flag Day organised by District Police, Retired Dy SP Prabhudev Mane said complexity of the profession should not yield police against the work pressure, as the police are always expected to render the best. He said police personnel are bound with responsibility of maintaining law and order. The professional hazard is immense and police should not be detered by any given situation while performing the task. The system is too complicated and they have to encounter frequently awkward situations. However, it is up to the police to stand against all odds to perform best. He said most important rule of policing is maintenance of good relations with public as part of confidence building measure. The public support is necessary for police to do justice to the assigned responsibility. He called upon his former colleagues to concentrate on disciplined healthy lifestyle, as pressure in the field would have its impact on the health. He also urged the police personnel give importance to providing education to their children. As many as 40 retired police personnel were given away Rs 5.13 lakh worth welfare funds for healthcare needs on the occasion. Police Flag day started with brilliant parade escorting the guest of the day retired Dy SP Prabhudev Mane, here at the police grounds at Chandu Maidan.